Some stores are slow when it comes to standardization of their logos or decor, but perhaps none have been more notorious for this than Kmart. Even after their moderately successful rebranding campaign that began in the early 1990s, many of the chain’s stores held onto the older vintage logo scheme, and many (most?) never got interior facelifts. Even after the merger with Sears, when the company began experimenting with Sears/Kmart hybrid stores (Sears Essentials) many of the interior elements had been left untouched. Judging by how much more successful Sears Grand was, and the fact that Sears Essentials is already being retired, I think that we can guess what that taught us. Unlike many of the old retail chains that we’re so fond of (Caldor, Bradlees, Venture, Prangeway, and even Ames), Kmart’s stores have rarely been terribly pleasant. When they’ve tried, they’ve built nice spaces, but most of the time they haven’t. When I took a road trip up to Vermont a few weeks ago, I found the Kmart above with its old logo intact on the city’s south side strip (along US-7). It’s one of the first of its kind that I’ve seen in years, so I figured I should swing in and snap a few pictures. I also have these other photos of old Kmarts in Sacramento and Iowa City that have been sitting on my hard drive for awhile. I have no idea who took them or where they came from, so if they’re yours and you want credit then please let me know. Nice blog you guys have here..I found it mentioned in the Yahoo Group ‘Remembering Retail’ (My ID there is ‘progrockfan21’) that I am a part of. These old K-mart shots sure do take me back to my tyke years in the early ’80s with those old signs still intact. They were all pulled down at most of the Wisconsin locations through the 1990s as stores were changed to newer banners (Big K and so on). Austrailian K-mart stores (not affiliated with Sears Holdings Corp.) still boast the classic logo, though it has been modernized at least twice through the years. They were going to get a ‘Supercenter” / big-box type store going in the mid-to-late 1990s, but bankruptcy killed those ideas. A shame, as they could have done well with the regional following the chain had, much like how other regional chains had a loyal shopper base that Wal-Mart and Target all but drew away with newer looking stores and lower prices. I fear for ShopKo…they’re one of the few (only?) regional players left. Nice stores, but the prices justify the store’s appearance….not the lowest possible prices like Wal-Mart obviously. Aside from Wisconsin stores, they seem to be hurting everywhere else they are, especially in cities where Venture was located (They took over half the former Venture stores in 1997, mostly in Iowa and Illinois) They may end up mentioned on one of these blogs soon. Again, nice job here, and I’ll comment on more as things keep chugging along. I’m suprised that there are as many unaltered Kmarts as there are. Most of the ones around here were given the full Big Kmart treatment over a decade ago. Also, check out my recent gallery about a vacant Kmart in Manchester. I hold all of my notable retail journeys of Connecticut on Facebook (I’ve got over 30 albums of retail related photos and commentary) but I also have a ton of outtake photos on Yahoo (a host who holds more pictures per album). I’m curious as to how many K Marts got the green and white logo in what I’m assuming was their last “new image” before the Sears merger. I’m referring the the standard “Big K Mart” sign done up in green, with the facade on the front of the store painted light green and white, including the faces of happy shoppers painted in giant size on the storefront. The only one I’ve ever seen was in East Peoria, IL but its been a few years since I’ve been down that way so I don’t know if it still looks like that. The store in Lombard IL had the old logo for many years after the “Big K’ image took over, and somewhere I actually have a picture I took of the place. I would scan it and post it if I could but my pictures are too disorganized to find it easily. @Charles, I think it was about 4 or 5, all in a relatively similar area – IL, maybe into one of the states that border it. I remember in 1971 in Lafayette, Louisiana the very first K Mart. It was at the corner of Evangeline Thruway & Willow Street. It was huge. I remember the grand opening. I was 4 years old. This particular store was unique in the fact that the Supercenter concept was years away but they did have a food store section attached to the left of the store called K Foods. It lasted about a year, can’t exactly remember. I wonder if anyone out there remembers K mart’s old K Foods concept. Eventually it was walled off from K mart when it became an IGA and eventually a Piggly Wiggly. It was there old blue K sign and all until the early 90’s after I had relocated to Texas. When the Supercenter opened up at Ambassador Caffery & Ridge Road, they closed the classic old one. But I sure loved the old store. I remember shopping for a lot of my school clothes there and at the old Northgate Mall that was across the street. They closed the Supercenter during their round of restructing and now Lafayette has no Kmart left. The old store building is now an appliance store and a Payless Shoes. Kmart had only 1 store that opened in the 1960’s, and that was in Hammond Indiana on Indianapolis Blvd, bear I-80/94. That store supposedly opened in 1968, and was open until 2003, while still in bankruptcy, was a profitable store, though not much work was done on the building. It mainly got a paintjob, but it needed a lot more work than that. But Kmart wanted to keep the store open, but my aunt still has contacts with Kmart, and found out that the landlord refused to negociate a new long-term lease on the store, and when the lease expired, Kmart closed the store, despite it being a profitable store. Landlord was too greedy, and while Cabelas opened across the street on the old Woodmar property, the area doesn’t have the business that it used to. The shopping center behind the old Kmart was never busy, as the only exposure it has is from I-80/94 But this location was home to a full service Little Caesars, and liked having it there.. The Gary Indiana location on US 20 opened in 1973, and closed in 1994. It was next door to an old Zayre store, that later became Ames, and closed 4 years before Kmart closed this store. Not once did that store ever have any work done to the store. While the other Kmart stores were getting work done, Kmart decided not to do any work on the store, and was never that busy during the 1990’s. The site still sites vacant 14 years later, and the only store that retained the windows across the front of the store, where stores that had work done on them eliminated the windows in the 1990’s. The Merrillville Indiana store opened in 1977, and in 1992, that store added onto the building. I believe the original store was at the most 100,000sq.ft, and they added up to an additional 20,000 sq.ft to the store. This store still has some of the 70’s look to it as far as the exterior of the store, but the store did eliminate the windows from the store in the 1992 remodeling. I miss seeing into the store, and being able to look at the parking lot from the front of the store. The double-sided clock by customer service only works on 1 side, but the other side quit working a few years ago, and Kmart never bothered fixing or replacing the clock. It used to always be busy, but since Meijer opend a couple of blocks west of their store, Not many people shop there. When the company was in bankruptcy, I expected this store to close, and not Hammond, but it stayed open. The most recent work done to the building was a portion of the front trim was painted orange. That’s it. The Big Kmart name is still on the building. I have seen some Chicago area stores getting the new logo, and it’s much smaller than the last 2 logos. Only mart brings back some retro look to the old logo.. Like Hammond, Gary, & this store, the original eatery was in the back of the store, but located in direct view of the front entrance. That changed in 1991 & 1992 with Hammond & Merrillville stores, when the registers moved from the left side of the store, to the right side, and the eatery was changed to K Cafe, with the Hammond store getting a full service Little Caesars, while Merrillville got a regular K Cafe with limited Little Caesars food. The St John Indiana Kmart opened in 1982, with a modified look to the stores of the 1970 on the exterior. The brick was still used in the 1980’s, but the awning was made more of plastic than brick, and was bigger, and ugly to me. This was the smallest of the 4 stores that opened near my home. This store is the only one that doesn’t have a street sign either. Also, no eatery was ever put in this store, but did have a deli cart at one time, like the other 3 store, which I didn’t mention earlier. As merchandise got added to the store, the store started getting cramped. Kmart never planned out anything for expanding this store, and they’re now landlocked today. 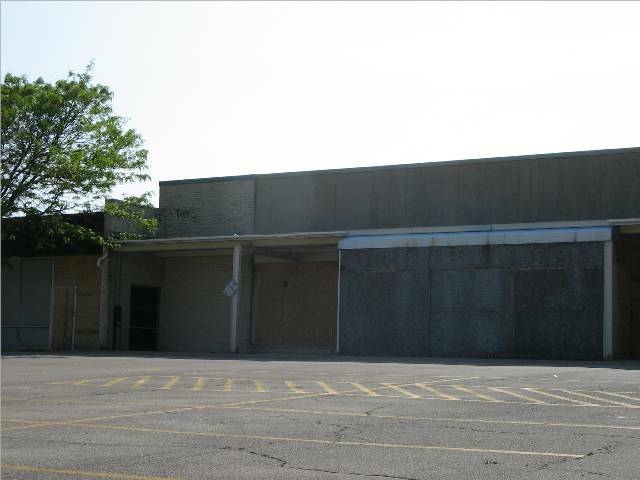 At one time, Kmart talked about relocating this store to neighboring Schererville Indiana, but never did, and decided to do some minr work to make the store look a bit update. 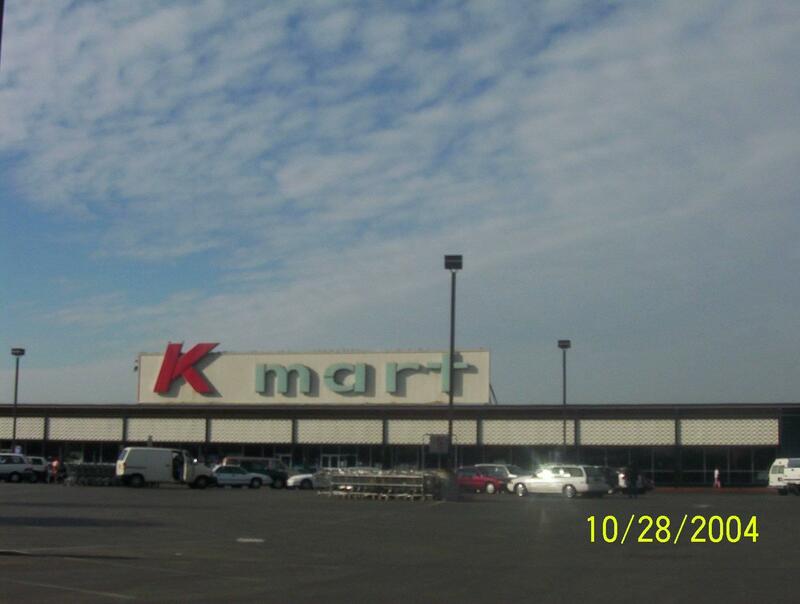 For some reason, they even put the Big Kmart name on this store, and it’s at the most, 80,000 sq.ft. I believe the original logo stayed up until 1996 or 1997. This store has no layaway, due to lack of floor & storage space. 1998 brought 2 more Kmart stores to the area, and both were former Venture stores. Griffth & Merrillville Indiana. The Griffith store is located at Ridge Rd & Cline Ave., while this Merrillville store at 61st ave & Broadway (across from what was once Zayre). Both stores had enough work done to have a Kmart look, but other than that, the stores retained a complete Venture layout. Griffith store has done ok, despite a drop in business overall in the area, and the shopping center that Kmart was in lost original tenant Service Merchandise. The thing that’s bad about this Kmart store is the lack of storeage space. Venture removed a lot of storage rooms when they remodeled this store in 1990. So Kmart has no layaway at this store. The Merrillville Kmart (former Venture, and not to be confused with the US 30 location, which was there since 1977) however did poorly at that location. Venture was a lot more profitable at this site. This store closed in early 2002 when the company filed for bankruptcy. It has remained vacant since then. Venture added onto this store in 1992 or 1993 taking a portion of the old Jewel store that used to be next door. Since Kmart’s closing, Blig Lots took the spot that was added onto Venture, and remained as part of Kmart. So the building is back to its original size. I don’t know who will take over the spot, but I believe that it’ll likely be divided, as the few retailers that are left want stores to meet their specifications, in both interior & exterior. @David, Speaking of the Merrillville Kmart(and also former Venture), does anyone know if that building still stands, and what store took the place of Kmart and Venture? 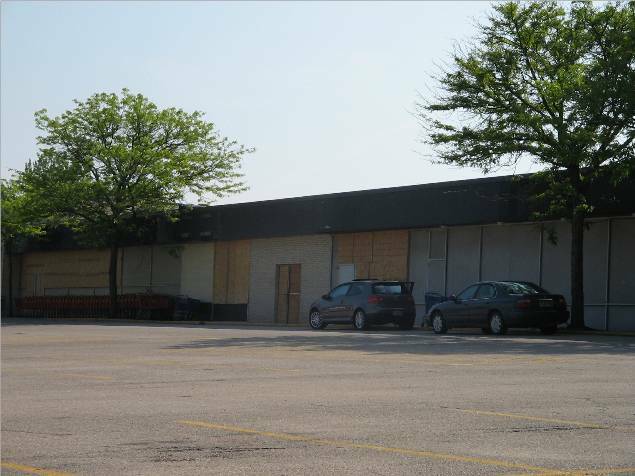 I knew about the one in Griffith that’s still open as Kmart, but I almost forgot about the Merrillville Kmart(ex-Venture) for whatever strange reason that closed down. @David, The K-Mart site on Indianapolis Blvd in Hammond is still mostly empty, with an Aldis and an Indiana BMV on the two side spots. The mall behind it (Builders Square was the anchor for that) was mostly torn down, leaving the Alverno’s specimen testing site by itself. I have heard many rumors about Walmart moving in there (or across the street), but will believe them when I see something happen. Only 5 stores got the lime green/gray logo. As for the Iowa Falls location…that has to be old…I recall going through there around 1990 and it was shuttered…parents said as soon as Wal-Mart moved in, KMart was done. When I saw “Old School K Marts,” the first one that came to mind was the one in your top photo– it’s on Shelburne Road (US 7) in Burlington, VT (or maybe South Burlington; it’s right by the city limits). I first visited there in ’03, and the store looked as if it were on its last legs (empty, outdated, kind of sad). But I came back a year later, and two years after that, and it was still there. I was there again this summer, and it looked busier than ever. It sure is strange, though, how the building’s exterior appears stuck in a ’60s time warp. I’m surprised it never got a makeover (with the big red K and all that) when they were doing a lot of that about 15-20 years ago. Mark, that store in the picture is the Iowa City location, not Iowa Falls. Plus, the sale sign has the 1990-2004 Kmart logo on it, so it had to have been taken during the 1990’s. Did Ft. Dodge finally update their K-Mart? When I was last through there in 2002-03, it was still the old style one, complete with a big neon sign in front with the red K and the blue Mart. Marshalltown’s featured the old logo inside the mall ’till about 2001. Sadly, the Ft Dodge store is closed. It had even received its update, too. Now it is the home of Shimkat Motors and Shoppers (a regional farm and fleet chain). That Kmart in South Burlington is the BEST. I’ve been shopping there since 1980. Almost nothing has changed except they closed the restaurant that is now the electronics dept and the jewelery department is now at now at your right when you come in instead of being in the front of the doors. 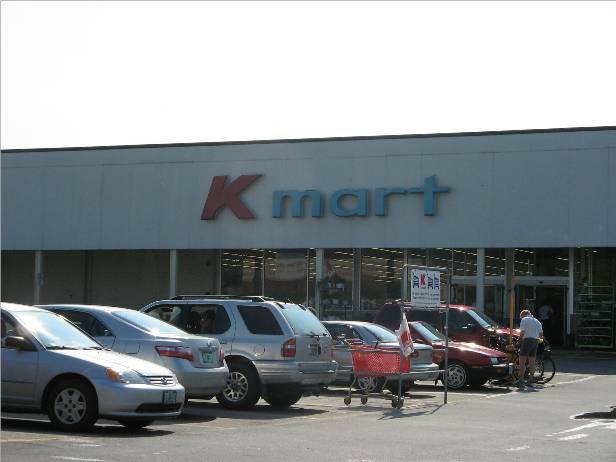 There is a Kmart in Coral Springs Florida that is almost he same as this one. I love going to the Kmart in S.Burlington because nothing has changed, you can also find the merchandise you are looking for, not like Costco that always change stuff around to make you buy more junk. I went also to the Kmart St-Laurent Quebec, great store, too bad they closed Kmart in Canada. The Kmart in Cornwall Ontario was great too. I love Kmart and long live Kmart. I went to an old school kmart in Glenwood Springs co last summer. The next time anyone comes across the 1988 documentary “Kennywood Memories” on their local PBS station, watch towards the beginning of the program, on the ferris wheel, there’s a nice camera shot of the plaza across the street of the old, missed Kmart. The store remained until the chain closed the location in 2003, and Kennywood used the building for storage for a few years after until the condition of the building warranted its demolition. The only 3 I’m sure about that are operational(plus a 4th one, if only for the fact it has it’s roadside neon sign left, though the sign on the store’s exterior has been updated), are Watertown, CT, South Burlington, VT, and Hamilton, MT(and this one was the south anchor to Valley Center Mall, with Albertson’s as the north anchor(not sure if this was the original north anchor. the middle section has unfortunately been demalled). The 4th one I referred to that still has its original neon sign(and I have no idea if this is the last one left in the entire U.S., with it’s 70s neon roadside sign), is the Carlisle Blvd. location in Albuquerque, NM. Glenwood Springs, CO of course also had a vintage Kmart store with the old school logo, but it closed down as part of the 1st round of SHC closures announced in December 2011, with the liquidation in very early 2012. The South Burlington Kmart sign did not change. There’s no restaurant nor cafeteria. There was one cafeteria there but it closed in the mid-80’s. The electronics department is now where was the cafeteria. I love this Kmart and all the other ones also. The only one similar to this one was Coral Springs Fl that closed unfortunately in 2010. I went to several Kmart’s and this one is one of the oldest. The only thing that changed besides the cafeteria, is that the jewelery is now at your right when you come in and the photo department is now closed because if digital photography. Does the South Burlington, Vermont Kmart still have the orange and brown interior, look, and design inside the store? Also, does anybody know how long the remainder of the lease is on this South Burlington, Vermont Kmart Store? I want to be able to visit it next summer. The Kmart is still opened. I was there a few days ago. The lease has been renewed. It does not have the orange and broan interior. It does not have the orange and brown interior. The design of the store is the same since it opened in the late 60’s or yearly 70’s. The lease is supposed to be up in April 2015 but I heard form some employees that It will be renewed. Per square footage, it’s one of the most profitable Kmart. You have to visit it, it’s the best old Kmart. i visited about 20, this one is my favorite. If you pass by Vermont, visit the Big Kmart in Plattsburgh, New York just across lake Champlain, it’s a 45 minutes drive with the ferry in Grand Isle Vermont. This Kmart is closing in January 2016. There are some good people working there, too bad. I started to go there in 1979, when I was a kid. Nice memories. It opened in 1975 and it was before a W.T. Grant. The cafeteria in the Plattsburgh, NY Kmart is now a Little Caesar’s. That store has a Big Kmart logo above the doors, but besides maybe a few fresh coats of paint over the years, the interior of that store hasn’t had a major update since the 80s. Fun factoid: The Plattsburgh Kmart is the only part of the old Pyramid/Champlain Centre South mall that wasn’t demolished in the early 00s. Originally one of the mall’s three anchors, it’s now part of a big-bix strip mall which also includes a Lowe’s, Price Chopper, and Bed Bath and Boyond. The one in Ironwood, MI is closing is a few months. While it does seem to have been upgraded a bit, it still has the windows behind the checkouts. I find that kind of neat because most big box stores have few windows (I remember a grocery store when growing up that had 2 story windows by the checkout and they would cover them with butcher paper with the deals of the week.